Quora, the nascent question and answer site founded by a small team of former Facebookers, has expanded its mobile capabilities in the last week with the addition of posting questions by SMS, letting you interact with the service via text message, starting initially with US support. While remaining primarily desktop Web centric, this addition opens the door for mobile question posting for impulse queries, and mirrors the heavy reliance on SMS from another Valley high-flier, Twitter, who continues to count its texting users among the most active and most loyal. Quora, true to form, has made the process of posting questions relatively simple, with single keystroke responses interacting with the system. As with the standard product, Quora abhors duplicate questions. Ask a question via SMS, by texting your question to the Quora service (having first added your mobile phone via the site and confirming it on the handset), and Quora will ask you whether you want to follow a similar, existing question, or post the question net new. Not sure if your question has already been submitted? Just enter "M" for More, or click any of the numbers to toggle through (and follow) similar queries. I tested the service tonight, opting to start with a simple question. 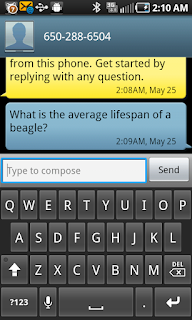 I texted "What is the average lifespan of a beagle"? Quora whirred into action, suggesting instead "What is the average lifespan of a blog?" and "What is the average lifespan of a race horse"? Opting for more got me "What is the average lifespan of a cell phone?" So there's some work to do. I changed the topic to be more tech-centric, where Quora has thrived, asking instead, "What is it like to be the CEO of a public company?". Unsatisfied with some of the preexisting questions, I just entered "A" to add my question, and it was posted. Assuming you do post your question on Quora via SMS, they promise to extend the conversation in the same way. In a post introducing the feature, Shreyes Seshasai wrote, "When you select a question, we'll send you a summary of the top answer on the page, along with a link to the full question page so you can view it in your mobile browser. It's a quick and lightweight way to check answers on the site." Quora has lofty aspirations. Making the product more mobile and pervasive, including this introduction of SMS support, will absolutely help. While I didn't find beagle to be the equal to blog or race horse, that's something the service will likely improve on with growth and more data being added to the system. To find out more on Quora and SMS, check the initial post from last Thursday.